Red spots, dots or bumps can appear on the skin, either all over on the body or on specific areas like the stomach. Sometimes, red spots on the skin can occur just on the the stomach or spread to the nearby regions, such as the back, sternum or whole chest, face, neck, arms, wrists, legs or ankles. Some spots are flat, others are raised; some are smaller than others and some disappear, while others remain unchanged or may grow, change color or develop new characteristics. They may be itchy or not or feel dry or not bother you at all. Every characteristic or small development in the appearance or feel of red spots on the stomach or any other area on the body is a telling symptom that hints at the cause behind the spots. The first thing you should do if you notice red spots appearing on the stomach or anywhere on the body is to see a dermatologist for a check-up, diagnosis and adequate treatment. What causes red spots on the belly? 1) Allergies. An allergic reaction can cause a skin eruption in the form of multiple small, red dots on the abdomen, spots or bumps. The rash may start off slowly with one or a few itchy, red patches and spread to the entire abdomen or chest (most likely), or other areas of the body. The spots on the stomach may vary in size: usually the larger patches of irritated skin appear separate, well-outlined, while the smallest ones are so close they are indistinct and form what appears to be an extensive reddened area of skin. Allergy spots on the stomach may be flat or raised, bright red, pink red or lighter than one’s skin, uniform in color or with a clear center. Allergy rashes with a clear center or paler than the skin and surrounded by a red circle are called target-lesions (or bullseye lesions). Red spots on the belly may be caused by allergic reactions to food (eggs, strawberries, avocado, eggplants, celery, celeriac, soy, milk, honey, nuts, seeds), medicine (antibiotics), plant hairs, prickles (nettle), chemicals (detergents, fabric softeners, household cleaning products), metals (nickel, gold, chromium), insect bites (dust mites, bed bugs, bees or other insects). If you know or suspect you are allergic to a certain food, medicine or other elements, avoid eating or otherwise coming into contact with the allergen to prevent anaphylactic shock. Anaphylactic shock is a medical emergency and requires immediate medical attention. In addition to avoidance of allergens, it is imperative that all allergy sufferers have their essential medication with them at all time. 2) Non-allergenic insect bites. Even if you are not allergic, insect bites and stings on the belly can cause tiny red dots, spots or larger irritated lesions at the site of the bite or sting. Mosquitoes, bees, wasps, dust mites, fleas, ants, ticks and all kinds of other insects can potentially cause different kinds of red spots on the belly or other areas of the body. 3) Sweating. Red spots on the belly can appear after workouts, after doing intense manual labor outside in hot weather or in an enclosed space where temperatures are high. They are caused by excessive sweating due to high environmental temperatures or increased body temperature as a result intense physical effort. When you sweat, clothes stick to the skin and cause friction as well as itchiness and a need to scratch the skin, resulting in a rash. The abdomen is one of the first to be affected, followed by the chest, sides of the torso and arms, especially if long sleeves are worn. There is also a condition known as cholinergic urticaria or heat rash, which is essentially a sweat allergy – a person develops an allergy-like rash when they sweat or feel hot. The condition manifests as a skin rash with small, pink or red, slightly raised, itchy bumps on the belly, chest, sides of the torso, arms. 4) Sweat rash (miliaria). Sweat rash is an irritation of the skin with redness, itchiness and tiny blisters filled with fluid. It looks like a small rash and is caused by clogged sweat glands. The more severe the sweat rash, the more extensive the rash. A burning sensation may also be present with severe irritation. The fluid-filled red dots are more likely to occur on the stomach and chest, back, in between skin folds and essentially anywhere where there is friction between skin and skin or skin and clothes. 5) Non-allergic contact dermatitis. Contact dermatitis is essentially a skin inflammation and can be caused by allergic reactions or contact with irritants. It causes a localized skin rash and if the allergen or irritant comes into contact with the abdomen, the rash will appear on the abdomen in the form of red dots, spots, usually with itchiness. Chemicals from housecleaning products, detergents, including dish detergents, fabric softeners, perfumes, soaps as well as the sap, spines, prickles or hairs of various plants are all possible triggers. 6) Acne. More severe acne affects multiple areas of the skin such as the face, shoulders, back, chest and stomach and can take the form of red pustules filled with liquid. Acne on the belly is an indicator of more serious hormonal imbalances or can be caused by ingrown hairs from shaving belly hair. 7) Benign (harmless) tumors. Every growth on the skin is called a tumor, but not all tumors are dangerous or require treatment. A lot of benign skin tumors appear as red dots, spots or growths and can occur on the abdomen, chest, neck, face, back, sides of torso, arms or legs. For example, hemangiomas like cherry hemangioma, cherry angioma, red mole or ‘strawberry marks’ are plain or composite, flat or elevated, circular or oval, bright red growths without liquid, smooth on the surface, occurring on the skin. They are essentially blood growths formed from blood vessels and are likely to occur in greater number with age. They can be as small as a freckle or look like small, red, smooth bumpy moles (but they are not moles). 8) Skin cancer. Actinic keratosis is a pre-cancerous skin lesion that may appear as a thick patch of rough, scaly, red skin skin. Squamous cell carcinoma causes red patches of scaly, sore skin similar to a crusted ulcer. It can be recognized by the fact that it appears as a red rash that bleeds and doesn’t heal completely. Basal cell carcinomas can appear as shiny, red nodules or red, eczema-like patches on the skin. Although likely to occur on sun-exposed areas of the skin, these types of skin cancer can also appear on areas of the skin that are not usually exposed to the sun, including the chest or abdomen. If you notice red, scaly spots on the belly with irregular edges and lesions that don’t seem to heal completely or recur, see your dermatologist. 9) Cutaneous small-vessel vasculitis. Vasculitis refers to a set of conditions characterized by inflammation producing damage to the blood vessels (veins and arteries) and other organs and systems. Cutaneous small-vessel vasculitis causes small to medium-sized red or purple circular spots on the skin that indicate bleeding underneath. The red spots may be flat or raised bumps. The disease typically affects the lower part of the body, but symptoms can appear on the upper part of the body too, including the belly area. Half of known cases have unknown causes, while the other half are caused by either autoimmune conditions (arthritis), infections (Streptococcus, Staphylococcus) or side effects to medication such as antibiotics or anti-inflammatory medication. 10) Pityriasis rosea is a skin rash. It starts off as a single patch of irritated, red, scaly skin followed by a generalized reddish rash days or up to 2 weeks after. Pityriasis rosea produces tiny, circular or oval , scaly red spots on chest and stomach, back and neck or more rarely, red spots on legs. It can produce itching, fatigue, low fever, nausea, fatigue and joint pain and typically lasts 6-12 weeks. It is triggered by a viral infection which elicits an immune system reaction. 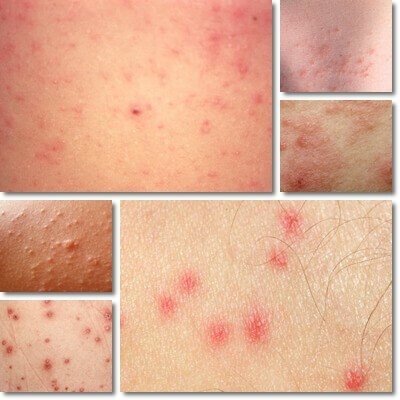 11) Keratosis pilaris. It’s a harmless skin condition caused by the production of too much keratin (a protein that makes up the outer layer of skin), which traps the hair follicle in the skin. The result is raised skin-colored or reddish bumps on the skin, similar to goose bumps. Irritation and itchiness may or may not occur, but scratching will leas to inflammation of the skin. Keratosis pilars is known to occur primarily on the upper arms, but also face, torso and extremities. 12) Petechiae are tiny, red and purple dots on the skin. Petechiae are caused by broken capillaries (smallest blood vessels) and are essentially signs of minor bleeding under the skin. Injury, bacterial, viral and parasitic infections, nutritional deficiencies (vitamin C, vitamin K deficiency) and various genetic conditions or acquired illnesses are some of the possible causes of petechiae. 13) Psoriasis is an auto-immune disease that causes abnormal skin manifestations: patches of red, itchy, scaly skin with silvery scales. It can affect the entire body, including the belly area. Areas of affected skin range in size from small spots to larger patches covering extensive areas of skin. 14) Folliculitis is inflammation of the hair follicles. A hair follicle is a tiny sac in the epidermis (outermost layer of the skin), where hair strands are rooted. Infection of the hair follicle causes inflammation and a skin rash with small, red bumps filled with liquid. Folliculitis can occur anywhere on the skin, including the arms, face, neck, back, chest, belly or legs. Fungal infections: ringworm (Tinea corporis), Tinea versicolor. All kinds of bacteria, viral, fungal infections produce skin red spots on the belly area, chest, back, arms etc. The spots can be small or larger, rounder or with irregular outlines, soft or scaly, papules (firm bumps without liquid) or pustules (with liquid), usually itchy and ranging in color from bright red to light pink. 16) Stress and anxiety. Stress and anxiety can raise core body temperature, cause sweating and lead to a skin rash. Conditions such as heat rash or sweat allergy can also be triggered by stress and anxiety raising body temperature and causing sweating. Red spots on the belly can vary in appearance greatly. Some spots are tiny like dots, others larger, with patches reaching over 2 cm and up to 10 cm in size (example: Pityriasis rosea). They may be flat or elevated (example: cherry angioma), with a smooth or rough surface. They can be dry and elicit itching (example: various rashes) or not itch at all. Edges may be regular or irregular and the spots deep to bright red to pale pink in color. 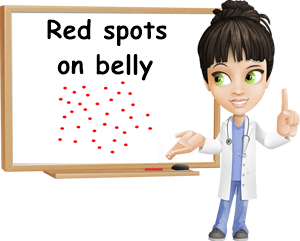 Finally, red spots on the belly can appear alone (example: an insect bite, a melanoma) or in clusters (example: allergy rashes, psoriasis plaques) and occur within hours, days, weeks or months apart. Red spots on the tummy may spread to other areas (back, chest, face, arms, wrists, legs, ankles) or not, depending on what is causing the spots to begin with. Treatment of red spots on the belly depends on the causative agent. The first step is to see a dermatologist for diagnosis of the condition. 1) The dermatologist may recommend an itching cream such as calamine lotion for insect bites, plant stings or infections like varicella (chickenpox). 2) For spots on the stomach or rest of the skin caused by infections that produce fever like measles, fever reducing agents like ibuprofen may be recommended by your doctor. 3) For bacterial infections like scarlet fever that produce dots on the stomach and other areas of the skin (including some transmitted by ticks), your doctor may prescribe antibiotics. 4) Fungal infections like ringworm are treated with antifungal medication. 5) Conditions like vasculitis, petechiae require a multifaced approach in terms of treatment. 6) Autoimmune conditions like psoriasis require stress management strategies and therapies for reducing immune system inflammation. 7) Topical antiseptics, antibiotics may be recommended in some cases. 8) For conditions like heat rash or sweat allergy, it is advised to wear light, loose-fitting clothes from natural fabrics, shower with warm or cool water, avoid working in hot environments or high temperatures and shower as often as needed to prevent secondary bacterial infections. Prevention can be achieved by vaccination (effective for diseases like rubella or chickenpox), good hygiene, especially to prevent complications like secondary bacterial infections, good nutrition, vitamin and minerals supplementation and avoidance of irritants and allergens.